This charming little redundant Norman church, now belonging to the Churches Conservation Trust, sits in an idyllic spot in the Lambourn Valley, adjoining the much later East Shefford House. This is all that remains of the village of East Shefford, one of the major homes of the ubiquitous Fettiplace family. The church stands as their private mausoleum, dominated by the family memorials. Sir Thomas' is a particularly well executed double effigial monument upon which he and his wife lie in fine armour and costume typical of Henry VI's reign. Lady Beatrice was a Royal Princess of Portugal, though possibly through an illegitimate line. The early wall paintings around the chancel arch and elsewhere depict a nativity scene with angels and kings still visible. There are some brightly coloured medieval tiles on the floor and 16th century heraldic and figured glass in the East Window. The stone coffin-lid at the west end was discovered in the churchyard over the grave of a medieval priest still holding his chalice and paten. 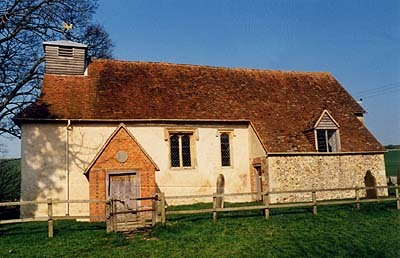 Architecture: Tiny Norman church of about 1100 with a late 15th century South Chapel. Monuments: Sir Thomas Fettiplace 1442 Effigies; John Fettiplace 1524 Brass kneeling figures.